Design magpie and nomadic aesthete. These are words often used by clients to describe the aesthetics of Katharine Pooley. 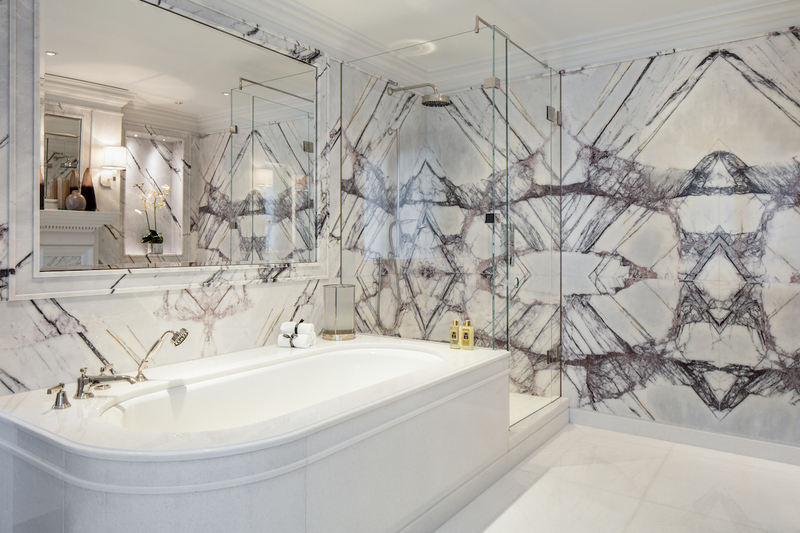 During a 2 week tour in Southeast Asia, the director and founder of one of the most sought-after interior designers in the United Kingdom met up with PrestigeOnline.com to discuss her eponymous label, the inspirations behind her designs, her recent projects and on building an empire. The following text has been edited for clarity and length. 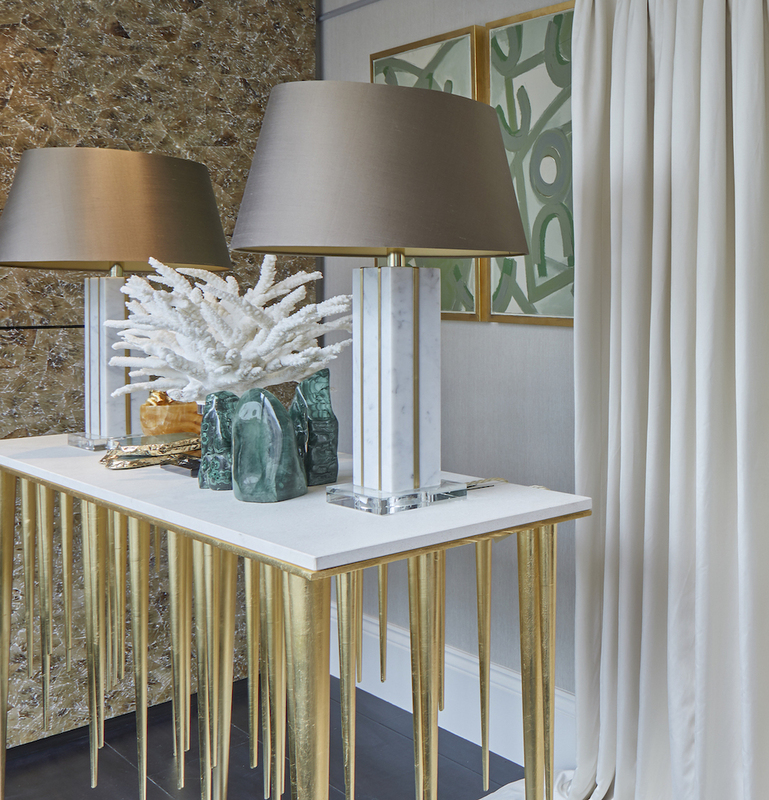 Images provided by Katharine Pooley Ltd.
A stalagmite console spotted at Pooley's boutique in London, decorated with coral and malachite accessories. Pooley strikes a pose in the entrance hall of a large villa in Kuwait that was entirely designed by her. 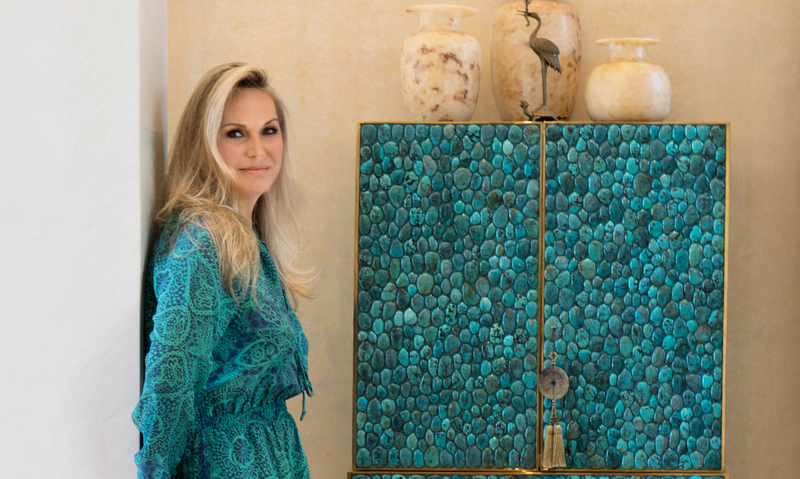 Next to her is a fabulous cabinet clad in turquoise which was designed by Kam Tin. For readers who might not be familiar with your brand, what would you like them to know about Katharine Pooley Ltd? It’s a brand that’s been going for 15 years. We have 47 people in our staff team and a management board of around 12 people — all of them have been with me for over a decade which is nice, because I think it really helps with our aesthetics. Besides London, we also have offices in the Middle East as well people based in Canada and also Hong Kong. I also lived and worked in Hong Kong for about 16 years, while my family lived and worked in the Middle East. So, I’m quite culturally well-versed with how people like to live their lives which I think that makes a big impact especially when you’re designing someone’s space. 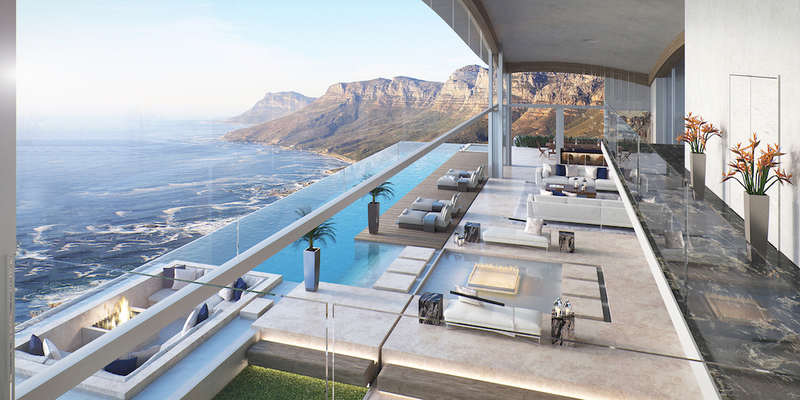 I don’t have a particular brand style; for me, it’s about visualising the client’s dreams and making it reality. Every house is very different, there’s not one that’s the same. Any recent projects that you’d like to share with our readers? We just completed a 46,000 sq ft residence in Qatar which is big, even for English standards. This will be my third home for this client, who only saw it this afternoon for the first time. He never saw a mood board or anything and just said, “Go ahead”. As you can imagine, there’s a lot of trust involved in this project. We also just did The Great Gatsby suite with Turnell & Gigon, which is a company that provides fabric to the royal family in the UK. Initially, I was quite intimidated to be asked to this because these are very established designers, very well-known and very well-regarded. You also have to use their fabrics, and Turnell & Gigon are renowned for floral and classical fabrics — but they also do very contemporary fabrics. So, I decided to do a Great Gatsby theme because a lot of my clients really like Art Deco. Lots of gold and blacks, silver and platinum, very lavish. I also had all the mantle pieces made up in marble with white feathers coming out and the ceiling. We took dry flowers and had them cascading down the ceiling, very impactful and magnanimous. Once everything was done, we threw a party where anybody who is an interior designer in the UK was in attendance including people who never come out of the woodwork. It was very well received. Can you tell us a bit more about the interior design process at Katharine Pooley Ltd? Each client will have a brief, but we’ll also work with them along the way. For example, we’ll have mood boards, and fabric choices, we’ll make CGI and renders so they’ll see what they’re getting. We do a lot of presentations before we commit to anything so that they have a really good feel of what they like. A lot of our clients also come with their own images which they’ve taken from Pinterest and Instagram that really helps us to understand their briefs. Generally speaking, I like to think that I’m quite a good reader of my clients so I usually understand the brief. A lot of our work is also repeat business so we already know their tastes quite well. I can’t say I’ve ever been frightened of doing a brief; there have been times where I thought to myself, “Does the client know what they want?’ and would therefore need to go back to ask more questions. If a client is living overseas, we’d need to spend more time with them to really understand from a cultural perspective — every nationality has a different culture, so it’s very important to understand this. Having been able to live overseas for many years really helps me in bridging that together. For example: Our clients in India love gold while bronze is coveted in the Middle East, whereas chrome is quite popular now in England. Everybody is different, so it’s really just about understanding the different requirements. It would probably be my father as we’re like two peas in a pod, very similar. He’s very well travelled, orderly and has great passion for the universe. Travel also plays a major part of my design ethos; I get inspiration from everywhere I go, every nationality, every person that I meet along the way. In fact, my photo album in my smartphone is full right now because I’m constantly taking photographs during these journeys. Traveling is really important to me. Any interesting observations that you’ve picked up while traveling? Every time I travel, I learn something different. I was recently staying at The PuLi Hotel and Spa in Shanghai. For me, Shanghai tends to be more classical, but they can also do a twist of modern mixed with Chinese traditions. It was really nice to go there and see all of that in harmony. I’ve always done east meets west, old and new. Antiques with new things. These actually work very well together, but it’s got to have a story behind it. 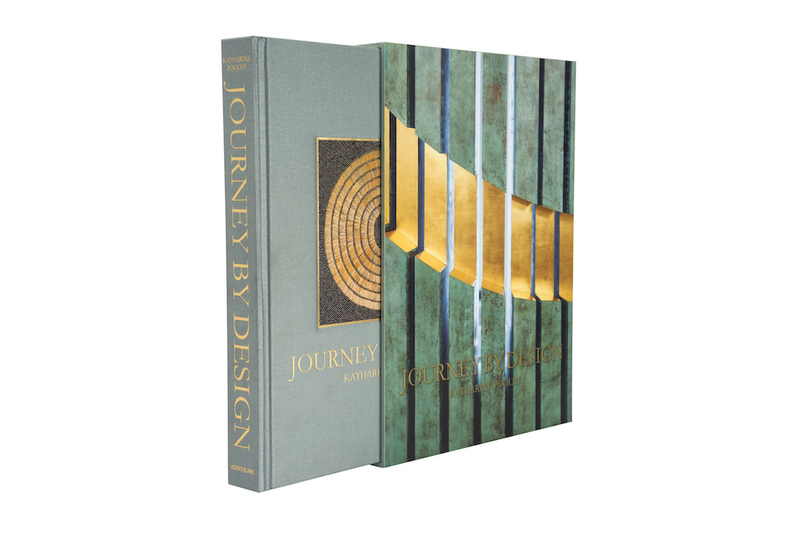 "Journey by Design”, a luxury interior design book launched in September 2017 by Katharine Pooley in collaboration with Assouline. 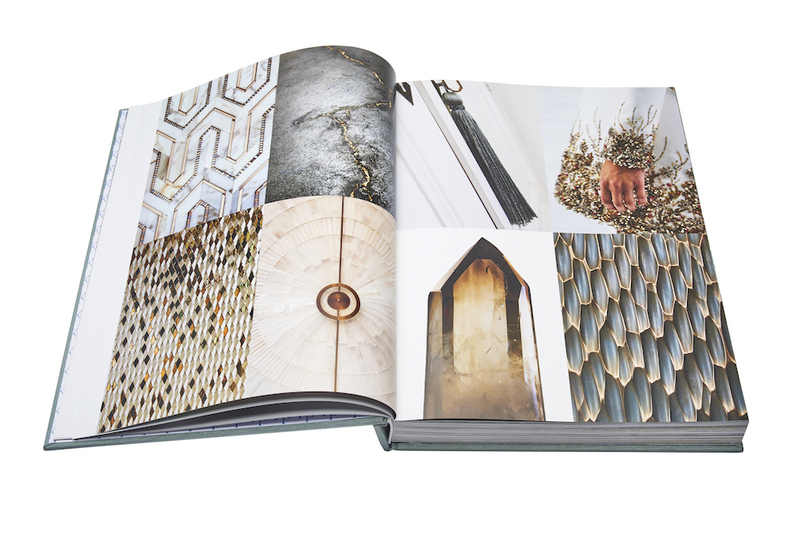 The book explores the creative process and diverse inspirations behind nineteen of the designer's inimitable spaces. What’s your absolute favourite part about decorating a home? Each decoration has a different element to it. I personally love fabrics with specialist finishes; I feel that I have a great synergy with fabrics. The designing and installation process is also my favourite part as I love seeing things come to fruition. To get to witness our client’s reactions after a brief is completed is also one of the nicest things. Any fabric trends that our readers should know about? I always say that you shouldn’t follow trends; you should set them instead. There are so many amazing fabrics such as Turnell & Gigon, Holly Hunt, C&C Milano, Rubelli, Jason D’souza, de Le Cuona… I have my favourites. What is your vision for the Katharine Pooley brand in the near future? It’s very funny building what I call an empire. Rome wasn’t built overnight, so my advice would be to just take your time. I don’t want to grow so big that it’s unmanageable. However, I also want to go out with a bang just like Gatsby — I want to be remembered, that’s quite important for me. I’m going to keep doing this for another decade, and start being more selective about which projects that I take on. It has to be ones that are memorable and special, doesn’t matter where or who for. They just have to feel right. I also want to do more personal projects; I just did my first one just last year. I want to do some hotels because you get more recognition for them, and I would love to do a private jet or a big plane like a 747, and maybe some boats. The best way I would summarise all this would be “success, in a humble way”. I never want to be so famous where you are photographed everywhere. It’s great to have a career where you feel regarded and respected; it’s great to have a job where you love getting up every morning; and to also have some spare pennies so you can spoil the people around you.